Arguably no other part of a castle has fascinated people as much as the dungeon. Originally, dungeons formed part of the castle keep and were basically the last defensive part of the castle. 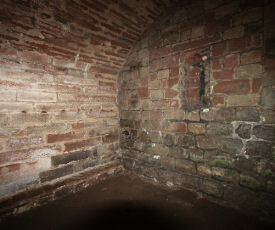 Photograph left: taken inside the dungeons of Carlisle Castle. Deep inside the castle keep, this is where prisoners were housed in complete darkness before trial during the Jacobite rebellion. As castles became more luxurious, their dungeons became associated with prison cells and often they were located underground. Technically speaking when people talk about a dungeon what they often mean is an Oubliette. This comes from the French for "to forget". Basically a prisoner was put in here, forgotten about and left to die. The most common form of Oubliette was a room only accessible from a hatch in a high ceiling, basically you couldn't escape without outside help. An alternative design was a long sloping tunnel with one shelf (for the prisoner) and nothing but water or the sea at the bottom. The victim could stay on the shelf and starve or throw themselves down and drown. 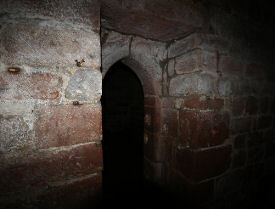 Photograph right: dark and forboding, the narrow entrance to the medieval dungeons in Carlisle Castle. Situated in the bottom of the great castle keep with its tremendous thick walls and limited access, there was no way to escape for prisoners kept here.